A man enters the culverted remains of an ancient Glasgow stream. Deep below the city it is decaying and claustrophobic, and gets more so with every step. As the ceiling lowers to no more than a couple of feet above the ground, he finds his path blocked by another person. But the person is has been murdered. DS Narey leads the investigation to find who the victim is and who killed him. Photographer Winter begins an investigation of his own, through the shadowy world of urbexers, people who pursue a dangerous and illegal hobby, a world that Winter knows more about than he lets on. Meanwhile, DI Derek Addison is trying to prevent an escalating drugs war which has already left several casualties in its wake among the city's rival gangs. A new face in town is upsetting the established order. 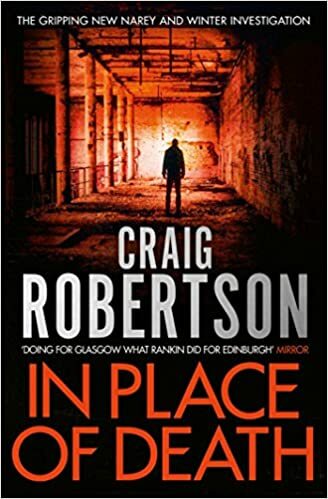 Against a backdrop of hauntingly atmospheric and dangerous buildings, the tangled links between the gangs and the urbexers who have strayed unwittingly into deadly territory draw all three investigations together. I enjoyed this book and despite being part of a series, it read well as a standalone. Honestly, I had never heard of this series of books before or indeed the Author, so I approached this blind without even reading the blurb. The plot was a good one and it flowed flawlessly and right from the first page I knew this was going to be a good book. When I read I always visualise it and almost always use actors I see on the Tv. For this one it was the Silent Witness cast and If you want a TV comparison I would say thats a fair one.